Home » Kitchen Help Category » Readers and Their Kitchens » How to repair 1950s faucets without removing tile — and see Randy’s Mermador! How to repair 1950s faucets without removing tile — and see Randy’s Mermador! You know I love it when I gets to see me something all-new old. How did I run across Randal and his vintage Mermador shower door? The one in his lovely, 1955 pink tiled bathroom with the ming green Crane (?) toilet, tub and double sink vanity? I do not know. 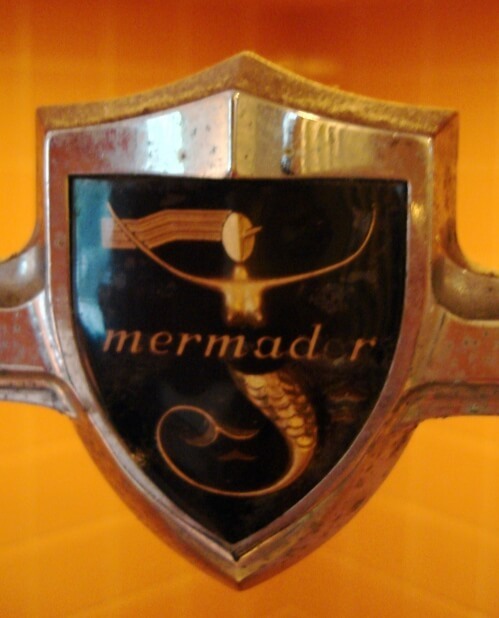 But, I love Randal’s bathroom… and his post about fixing his plumbing… and most of all, his Mermador shower door. Read on for more, from Randal…. Love your site! Thanks so much. Just started visiting it, but have already ordered Remcraft light fixtures for the outside of our home and after we paint our living room, I will be buying rugs from Dash & Albert. You are my hero! I have a blog focused mainly on bicycles, but I did a post — “Sometimes a Plumber” — on my faucet repair project in our awesome 1955 pink bathroom. Thought you might want to share it with your readers. I had original American Standard faucets in the tub and shower with one leaking stem and all of them near the end of their useful life. Terrified about having to tear into tiles to replace entire fixtures, I undertook the project of gently restoring what I had. I found replacement stems and surrounds on line, installed them myself and took lots of pictures along the way. The project took weeks as I let liquid wrench work its magic on calcified parts. It came out beautifully! I stared at the thing for minutes. Felt like hours. I wanted to see into it, to know if it was about to disintegrate or in good condition. My x-ray vision would not come up no matter how long I stared. I placed the wrench and gave it a meager push. Clockwise to tighten it. Nothing. A harder push. Nothing. A little more and… it moved! I stopped. I was pumped and terrified. I got really conservative all of a sudden. Maybe the sixteenth of a turn would be enough. I ran downstairs to turn the water back on to see if it had stopped leaking. Sadly, it hadn’t, but I now knew if I could tighten it, I could loosen it. If I could get it apart, I had a chance of finding the right part on the web and fixing it myself. No new fixture. No tearing out tiles. No, Randal, YOU are MY hero! You are added to the blogroll, Mr. Randal Loves to Pedal, and I have become your biggest fan. You’ve also given me a kick in the pants — I need to REALLY WRITE, more. Oh, my heart swoons for vintage tile bathrooms! I love everything about the Mermador. Randal – what a great bathroom. Love the under tile double sinks! would love to see the INSIDE of your shower too! Also, looks like you have that same refreshing blue – perhaps in the hall – as I do. I’m not sure how it happened, but I got messed up – -Jacob’s correct name is Randal. I am fixing all the posts and comments, too. sorry ’bout that, Randal!